It is important to always look for a karat mark when choosing gold jewelry (18k, 14k or 10k). This information will be stamped somewhere on the piece and is your assurance your are buying true gold jewelry. The karat mark of gold refers to the amount of pure gold in a piece of jewelry. 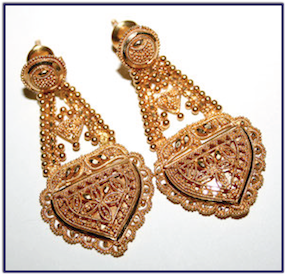 In its purest form, 24 karat, gold is very malleable and is generally considered too soft for practical use in jewelry. However, some cultures create pieces of jewelry exclusively from 24 karat gold as they believe the bending and reshaping of the piece over time makes for a truly unique item. In traditional jewelry-making pure 24 karat gold is alloyed with harder metals, and most jewelry will be made from 18 karat, 14 karat or 10 karat gold. For example, an 18 karat gold ring will be a mixture of 75 percent gold and 25 percent of harder metals, or 18 parts pure gold and 6 parts harder metals. Alloys of less than 10 karat cannot be stamped with the karat mark and are not considered real gold. The color of the gold can depend on the metals used in the alloy. For example rose gold is made by alloying pure gold with copper, giving the metal a pinkish hue. Green gold is commonly a combination of gold and silver. Naturally occurring green gold, called electrum, has been used in jewelry for nearly 3,000 years. And, white gold is created by plating karat gold jewelry in a metal called rhodium which gives it a unique bright silver color. Some jewelry is processed and plated with a thin layer of gold over a less expensive metal, such as silver. It may be marked gold-filled or gold-plated. This plating can wear over time, and only solid karat gold offers the lasting characteristics of a precious metal. At Lake Country Jewelers we offer only the highest quality 14k and 18k gold jewelry from the finest manufacturers. Contact us or visit our store and see hundreds of fine gold treasures in a wide range of affordable prices.